The US Navy has put four Boeing-built ground-based flight simulators into operational use to train naval flight officers (NFO) at Naval Air Station Pensacola, Florida, US, to enhance safety and reduce costs. 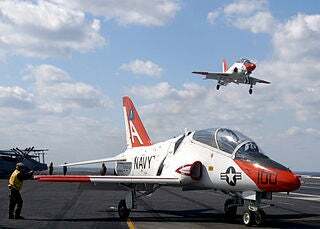 The new trainers with advanced capabilities will help the navy move certain training to ground, while freeing up its McDonnell Douglas T-45 Goshawk trainer aircraft fleet to offer live flight instruction. "This allows the navy to add an array of virtual wingmen and synthetic threats, building a more robust mission rehearsal." Boeing Training Systems and Government Services vice president Mark McGraw said the simulators would train almost 150 students on an annual basis. "This allows the navy to add an array of virtual wingmen and synthetic threats, building a more robust mission rehearsal," McGraw added. Training on the simulators will help students become familiarised with capabilities such as navigation, communication, emergencies, target identification and weapons employment, and basic carrier operations, as well as other learning objectives. Capable of providing high-fidelity and advanced visuals, the simulator devices will also provide advanced instruction for transition to Boeing EA-18G Growler electronic attack aircraft, McDonnell Douglas F/A-18 Hornet aircraft and Northrop Grumman EA-6B Prowler aircraft. Operating from the back seat of the aircraft, NFOs specialise in airborne weapons and sensor systems. Powered by a single Rolls-Royce navalised Adour Mk871 twin-spool non-afterburn turbofan engine, the two-seat advanced T-45 Goshawk jet trainer features revised avionics and modified cockpit layout for compatibility with frontline US Navy combat aircraft. The unarmed trainer aircraft has a single pylon installed under each wing for carrying bomb racks, rocket pods or auxiliary fuel tanks. Image: A T-45 Goshawk training aircraft landing aboard the aircraft carrier USS Theodore Roosevelt. Photo: US Navy photo by mass communication specialist 3rd Class Jonathan Snyder (Released).